Alfa Romeo has updated the MiTo with new engines and trim level names, all designed to make buying one more straightforward. Despite the changes prices have actually gone down with the cheapest model - the 1.4-litre Progression - now costing £12,250 while the top 1.4 TB MultiAir Quadrifoglio Verde (or Cloverleaf as it used to be known) is priced at £17,995. There's also a new low emissions version which emits less than 100g/km of CO2 meaning zero annual VED and exemption from the London congestion charge. This is powered by a new 1.3 JTDM-2 (replacing the 1.3 16v 95bhp unit) which produces a healthy 85bhp and just 95g/km of CO2. The other new engines are a 1.4 8v 78bhp (replacing the 1.4 16v 95bhp unit) for lower emissions, superior economy and an engine start/stop system as standard. Plus there is a 1.4 MultiAir 105bhp (available with Sprint or Distinctive trims) which effectively replaces the 1.4 16v 95bhp engine. Trim levels have been simplified too from 17 versions down to nine with both Turismo and Lusso trims being replaced with 'Sprint'. Entry level versions are now known as 'Progression', while 'Distinctive' and 'Quadrifoglio Verde' versions replace Veloce and Cloverleaf. Distinctive (formerly Veloce) and Quadrifoglio Verde (Cloverleaf) are both upgarded with additional equipment including cruise control, sports pedals and rear parking sensors. 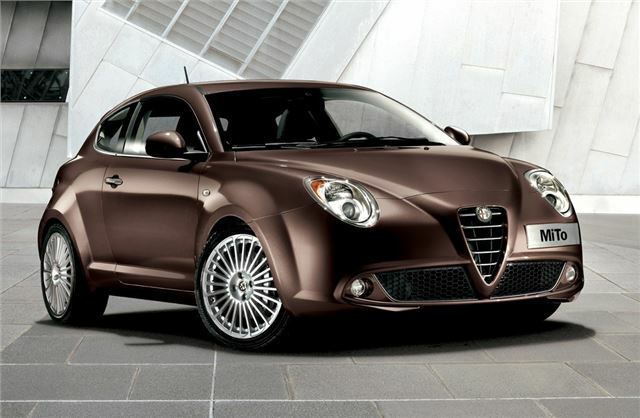 The Alfa MiTo will be available in Metal Bronze, a colour entirely new to the Alfa range, having been previewed at this year’s Geneva Motor Show. On Progression and Sprint versions, it can also be chosen with new Sprint Bronze upholstery. The new Alfa Mito range goes on in May 2011.